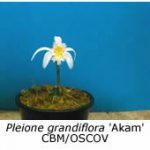 There are two sections in the genus Pleione, the autumn-flowering or two-leaved species, which require slightly different cultural conditions to the main section, namely the spring-flowering pleiones, which have a single leaf. 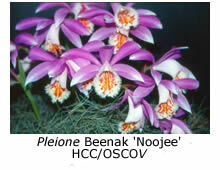 This account will deal only with spring-flowering pleiones. June, July and August . 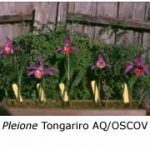 At this time of year pleione bulbs are dormant, so now is the time to purchase more bulbs to add to your collection. 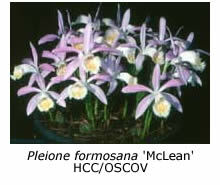 Those of Pleione formosana are the most readily available. 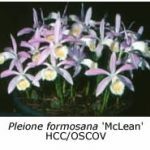 There are many different clones, for example, P. formosana ‘Pricei’, P. formosana ‘Serenity’, P. formosana ‘Oriental Jewel’, P. formosana ‘Clare’ and P. formosana ‘Polar Sun’. The last two have white flowers, while the most common clone in Melbourne is P. formosana ‘Blush of Dawn’. 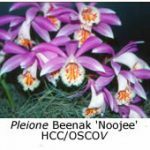 When buying pleiones, select undamaged bulbs that are 30-40 mm in diameter and a good green colour (or purplish black in some clones). They should have at least one new growth enclosed in a brown sheath on the side of the bulb. Well-grown bulbs can produce up to three new growths from their base each season. If the original old shriveled bulb is still attached, remove it carefully and discard. Trim the roots of the new bulbs back to a length of about 40 mm. These shortened roots will help anchor the bulb in its mix and prevent it from pushing itself out of the mix as its new roots begin to grow. Many different potting mixes can be used. I use a compost comprised of 6 parts of pine bark (12 mm particle size, with all fine material removed), 1 part of coarse gravel or Perlite, 2 parts of Sphagnum moss chopped into 6 mm lengths and 2 parts of chopped or well rotted oak leaves. I then add two handfuls of poultry or sheep manure to each bucket of mix. Most people grow pleiones in shallow containers but I feel the plants do better in pots about 100-125 mm deep. Shallow pans tend to dry out too quickly during our hot, dry summers. The mix should drain freely and there should be plenty of drainage holes in the pots. Fill the pots to within 25 mm of the top with potting mix and then thoroughly soak the mix with water to flush ‘the fire’ out of the poultry manure, which can otherwise burn the tips of the new roots as they begin to grow. When the mix has drained, place the bulbs on the compost and fill in around them to three quarters of their depth with a mix made from equal parts of pine bark (3-6 mm) and finely-cut moss. The bulbs can be planted as close as 10 mm to each other, as they seem to grow better if closely spaced. Water again to settle the mix around the bulbs and place the pot in a cool place under 70% shade cloth. Throughout July and August in Melbourne pots can be left outdoors provided that they are protected from severe frost or hail by a layer of shade cloth. They should also have snail bait sprinkled about them. September and October . As the daily temperature rises to 14° or 15°C and the days lengthen to 10-12 hours, the flower buds and a few new leaves begin to appear. When the new buds are visible, move the pots under cover to protect the flowers from weather damage. At this time the new roots are beginning to grow. They will brown off and die if the plants are watered when they are warm. 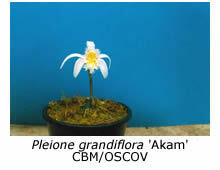 Pleione roots do not branch again after they are damaged, which means that the roots are lost, followed by the new growth. I water only at night, when the temperature is falling. I mist the plants lightly, just enough to keep the mix slightly moist. After the flowers have died, the leaves begin to grow rapidly. This is the time to increase watering gradually and to begin fertilising. Because of the moss in the mix, I use an organic fertiliser, such as weak liquid manure. November and December. By late November or early December the new growths will be well developed and the new bulbs will begin to swell at the base of the leaves. Tiny new white or pale green growths will appear near the base of these new bulbs. These growths will produce next year’s flowers. As we are now moving into our hot, dry summer period, it’s advisable to keep the humidity up to prevent the pots from drying out. Water heavily at night and continue fertilising. Do not water during the heat of the day. Plants like to be misted at night. January, February and March . During January and February the new flower growths at the base of the developing bulb will continue to grow until they are 12-25 mm long. Also, tiny bulbils will form from the apex of the original bulb. Up to four bulbils may appear and continue to grow during this period. Some may grow small roots. Handle the plants carefully, as these bulbils are easily dislodged. If they are, allow them to lie on the mix until next season, when they can be replanted. April and May. In early May the sheaths on the new flower shoots at the base of the still-enlarging bulbs will begin to brown off. They are entering their dormant period. The brown sheath will protect the new shoots within from winter cold. The tips of the leaves will also begin to turn brown during April and will continue to do so until the leaves fall in late April and early May. Once the leaves fall, watering should cease because the roots die two or three weeks later. The bulbs are once again completely dormant. The original bulbs will have withered. If you are growing your plants outdoors, it is advisable to lift the bulbs and remove the old ones soon. Otherwise rot can begin in the old bulb and spread to the newly formed growths. If you so desire, the pots can be left undisturbed and the plants allowed to resume growth next year, as in Nature, to produce a dense mass of bulbs and flowers. Under these circumstances it is desirable to move the pots under cover for winter and keep the bulbs almost dry. Occasional misting will stop the new bulbs from shriveling. Keep the dormant bulbs in a cool place, as they seem to need a period of temperatures down to 3°C to help flowering. 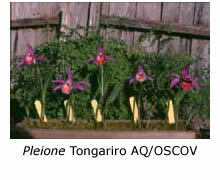 If well grown, Pleione formosana bulbs should double their weight in total bulb production each season.